The Inex Interactive C Robot Kit V2.0 includes the AX-11, a 68HC11 based microcontroller board, an assortment of great sensors, 2 DC gearboxes and mechanical parts for building and modifying 8 sample robot projects (see manual below). 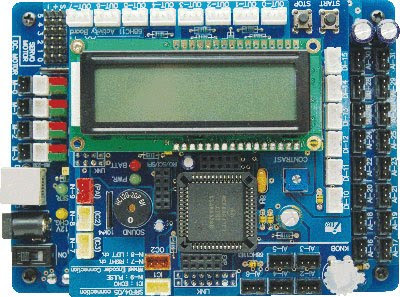 The AX-11 microcontroller board is a modified version of the popular Handy board from MIT. 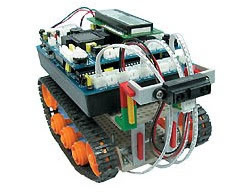 The AX-11 is a microcontroller system that is used to run robot design courses and competitions at the university and high school level, build robots for fun, and control industrial devices. This board uses the 68HC11 microcontroller and has 32KB non-volatile RAM, 9-digital inputs , 21-channels 8-bit ADC, 4-DC motor driver, 6-Servo motor driver, a 16x2 LCD module for display and an infrared LED with 38kHz IR module. Data can be downloaded from your PC via its RS-232 port. The Inex Interactive C Robot Kit is programmed in C. The Interactive C environment consists of a compiler (with interactive command-line compilation and debugging) and a run-time machine language module. It has many functions and libraries to directly support robot programming. This kit comes complete with Thai manuals (English manual can be found below) and CAI software for learning to program the robot. Everything you need to successfully build your robot is provided. The manual includes instructions on using a SFR04 ultrasonic rangefinder (RB-Dev-01), IR proximity sensors (RB-Lyn-02) and the CMPS03 magnetic compass (RB-Dev-03) which can easily be interfaced with the Interactive C Robot (sold separately). Add any of our sensors and increase its awareness!